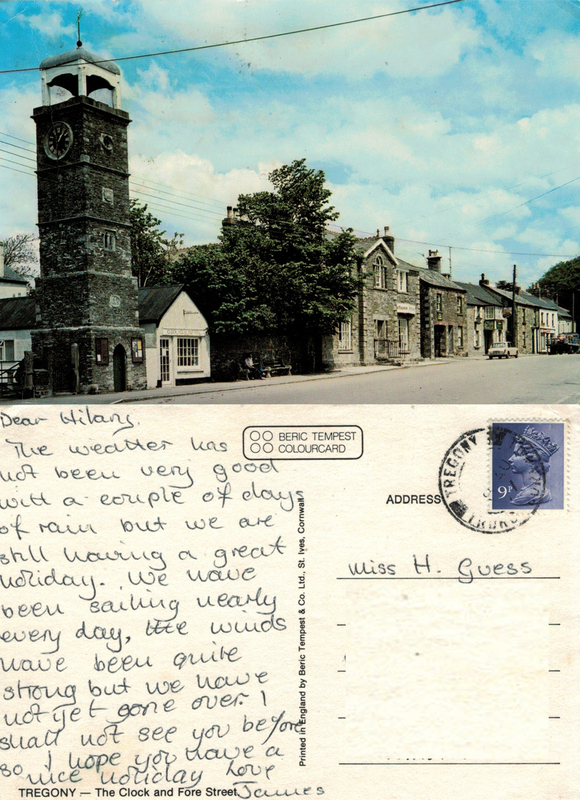 A newsy status update postmarked ‘Tregony Truro Cornwall 8th Aug 1977’ carrying a 9p stamp which was first class for a 2oz letter at the time. Tregony is on the River Fal in Cornwall and still looks much the same now as it did when this photo was taken. James’ family were members at the local sailing club, where my family sailed. James had a Merlin Rocket and I used to crew for him. There were plenty of social events and teenage discos and the inevitable snog… I have not stayed in touch with James. This entry was posted in History, Journies, Life Path, Nostalgia and tagged Cornwall, friends, history, Nostalgia, postcard, snog, snogging, stamps, teenage, Tregony, Truro. Bookmark the permalink. Where do you get the cards from? What’s your inspiration? oh, somehow i misunderstood, i didn’t realize they were all postcards you received. are you worried about what your blog will be when you run out? they’re awesome social history, primary source material. they are of interests if only because of where they come from, that could be significant. maybe when you become rich and famous (lol!) they’ll be published in a coffee table book! i like reading people’s collected letters. it really gives one a chance to see what ordinary people were like. that’s great thing about modern history, we can see how the average person lived and felt whereas in the relatively recent past historians only knew what the rich people, especially the aristocracy, were like. It’s great that you appreciate the social history aspect, because that’s exactly what I thought! I do have enough to keep going for a while, so we’ll just have to see how it evolves. You’re right about being scared to read letters from our past – I’ve asked permission from those I’m still in touch with, and they’ve all enjoyed revisiting their younger selves and found the process highly amusing 🙂 Thanks so much for commenting. you’re welcome, what you’re doing is right up my alley. i have a history degree, so i find this all fascinating. you should consider putting it together as a book! i bet a lot of people would find it interesting. there is something that my husband turned me onto several years ago, called postsecret, are you familiar with it? i haven’t paid attention to it in ages, but when i looked it up, it’s on wordpress! i think it’s on several blog sites. anyway, look at postsecret.com and i think you’ll fall in love with it.